Light, tasty, and packed with nutrients, these dandelion muffins have earned their name as being Dandy Muffin Tops. 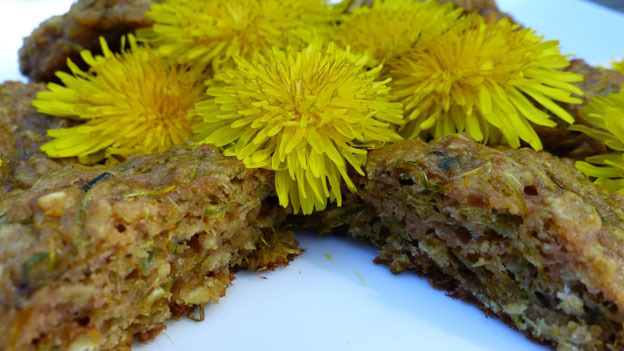 Enjoy worry-free snacking when dandelion muffins are in your kitchen. In one bowl place all wet ingredients and mix with a blender for 20-30 seconds. In another bowl, place all dry ingredients and blend well. Slowly mix the wet ingredients to the dry and stir well until everything has blended thoroughly. Using a large soup spoon, scoop dough onto a parchment paper-covered baking sheet leaving about 1” between dough. Bake about 10 minutes until the middle it properly cooked - allow to cool. • Dandelion flowers – when picking them, snip off the green sepal to ensure you are collecting mostly the yellow petals. Some green sepal matter is ok but keep it to a minimum as this can add a bit of a bitter taste to the muffin tops. • You can use sweetened or unsweetened apple sauce.